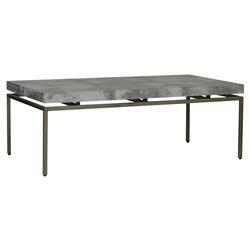 This simple yet chic coffee table brings a vintage, industrial charm to any room from living room to office. Finished in antique nickel, the streamlined frame maintains a bold, modern sensibility, while referencing elegant Art Deco designs of the 1920's. Seemingly floating above the base, a grey vellum tabletop lends an ethereal quality. This striking table makes the perfect addition to any home from luxury loft to eclectic beachside abode.